HE’S packed his bags for New York but Pat Langrell, in Brisbane last month as guest speaker at Faith on Tap, will also take with him a suitcase of irreplaceable memories. “My favourite memory of World Youth Day (2008) was standing in the middle of one of the city streets after the papal arrival,” he said. Working closely with TV presenter Ray Martin during the event and hosting a packed “Theology on Tap” gathering in Sydney during the week before the papal Mass in Sydney, the unstoppable 21-year-old who this month begins as co-ordinator of young adults for the diocese of New York, also has his sights on World Youth Day in Madrid in 2011. 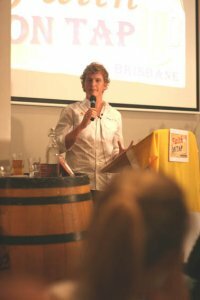 Born and bred in Sydney, his sister Jessica, 19, now takes the Theology on Tap reigns as host, among a team of others. A recent Theology on Tap gathering hosted popular Irish singers “The Priests”, and attracted a crowd of almost 1000. Certain of his calling overseas, Pat remains conscious he’s “just like everyone else”. “I’m certainly not different from a lot of young people I know,” he said. Praying constantly about the new role and feeling blessed “to be in the right place at the right time”, Pat looks forward to his siblings and parents visiting New York at Christmas. Reflecting on his achievements to date, Pat credits his faith-filled family and time spent in adoration of the Blessed Sacrament. “I can’t say how great it is to spend an hour each day in front of the Blessed Sacrament … just in a church,” he said. “To pray (like that) for an hour every single day I think you’ll be able to change the world … with that constant connection with living the presence of God. “It’s difficult to find an hour … but now with less and less time available if we can make an hour a day we’ll be better off. Deferring studies in law and with an undergraduate degree in arts majoring in philosophy, Pat remains committed to a life of prayer and Mass attendance, encouraging other young people to do the same. “Before you leave the Catholic Church or drift away, young people should try and understand what they are drifting away from,” he said. “I honestly believe no person in the world would drift away from the Catholic Church if they knew what it really is and what the Catholic faith is.